As well as choosing what type of underfloor heating you want to install in your home it’s worth being aware of how it will work with different types of flooring. One of the best options for use with underfloor heating is a solid flooring option such as ceramic tiles or flagstones. Stone is the most thermally conductive of the different flooring types you can choose, meaning that the heat from your underfloor system will be transferred more quickly and effectively. The thicker the stone the longer it will take to heat, but the good news is that as it heats up so well it won’t take much longer for the heating system to achieve the same results. Whichever stone flooring option you choose, be sure to use a flexible adhesive or de-coupling membrane to avoid hairline cracks in the screed which will occur due to the expansion and contraction through heating and cooling. Being fairly slim line, ceramic tiles will give you one of the most effective flooring choices and as they come in such a wide range of styles you are bound to find an option to suit your style and budget. Another great choice is the hardwearing, yet thin profile of slate tiles. They come in a range of different sizes and with their rugged yet smooth natural appearance they will not only work well to transfer heat, but will look great and require very little upkeep. Thicker than slate, but equally hardwearing and rustic, flagstones make a good choice for both traditional and contemporary homes. If you are looking for an elegant choice then marble really does convey a sense of luxury. It may not be the cheapest option, but its solidity and excellent conductivity make it one to consider if your budget allows. When the heating is not on, the marble will feel very cold. Wooden flooring works well in conjunction with an underfloor heating system as it copes well with changes in temperature, but it is not as good a conductor of heat as stone. Nevertheless, it is still a popular choice and there are several options available from a solid hardwood floor to an engineered timber option. Offering a natural finish that is hard to match, a solid hardwood floor will work well with an underfloor heating system, but will require gentle heating to avoid movement due to the presence of moisture which occurs naturally in wood. Using a hardwood finish attached to a laminate base this option will give you the beauty of a hardwood floor, but with the versatility of a laminate floor. 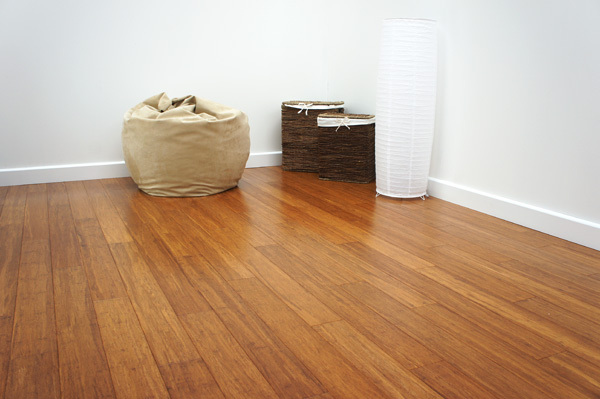 It gives a greater degree of flexibility than hardwood flooring, but has a more natural appearance than laminate floor. A good option for a lower price tag is the use of cross-ply laminate flooring. This offers more stability than a solid wood floor and will heat up more quickly than either traditional timber or stone flooring. Due to the thinness of this type of flooring the heat is transferred very quickly, but will not retain the heat as well as wood or stone. Care also needs to be taken with the upper temperature as some vinyl flooring will not cope with heat above 26 degrees Celsius. One of the most widely used flooring options, carpets can be used with an underfloor heating system, but will act as a layer of insulation if too thick, particularly if certain types of underlay are used. If the combined tog rating of the carpet and underlay is below 2.5 then you will be able to run your underfloor heating effectively. Be sure to get expert advice based on the heating system you wish to install or the flooring type present in your home, but rest assured that whichever type you currently have or want to choose there is an option for every taste and budget that will work well with underfloor heating. Sean Casey is the director of Terra Therma. His company specialises in the installation of green energy solutions, such as underfloor heating and heat pumps, using the latest technology to provide the most efficient systems for his customers.